Big grins at the summit in Taromina, Italy, last year. Who’s laughing now? The Canada G-7 meeting in Charlevoix, Quebec is beginning somewhat acrimoniously. It will not be a forum where leaders of the industrialised nations can meet in a relaxing atmosphere to discuss issues affecting the international community. Instead, it is shaping up to be a politician’s version of the UFC. Prime Minister Justin Trudeau is the host. He is proud of the themes and leader’s programme for this meeting. They are: a) Investing in growth for everyone. b) Advancing gender equality and women’s empowerment. c) building a more peaceful and secure world. c) Preparing for jobs of the future. d) Working together on climate change, oceans, and clean energy. The faces have been slapped; the gloves are off. In G-7 Fight Club, the only rules are Trump’s rules. It should have been a good week for the Canadian dollar. It wasn’t. On May 30, the Bank of Canada issued a hawkish statement, hinting at a July rate increase and leaving the door open for more. However, the positive Canadian dollar sentiment didn’t survive the month end, and trade jitters have been the catalyst. That’s when the US slapped tariffs on Canadian steel and aluminium imports, even though the Nafta renegotiations are still ongoing. Fears about the demise of Nafta and concern about a hawkish conclusion to the June 13 Federal Open Market Committee meeting are underpinning USDCAD. 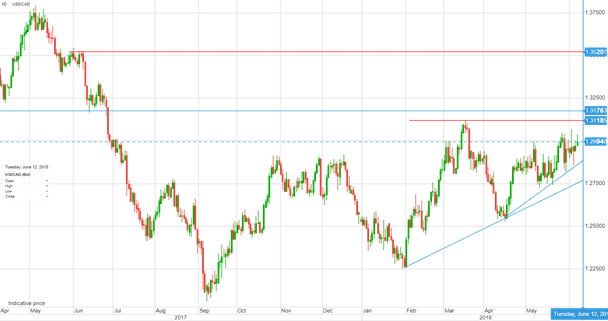 Chart USDCAD daily with long term support and resistance levels noted. Wednesday: FOMC meeting and press conference: Market expects 25 bp rate hike. The Committee may give a “hawkish” tweak to the statement.